ISEC7 Mobility for SAP is a lean solution to mobilize SAP processes. A SAP ABAP transport is imported into the SAP backend system and 3 web services are activated. Then our native generic app connects to these web services and loads the data. Simple as that! The installation usually takes one hour in a webex session! No additional components are needed. No Middleware. No Cloud. The development is done in pure ABAP development and customizing. All our customers are running the same native generic app. There is no app or HTML5 development needed by the customer. 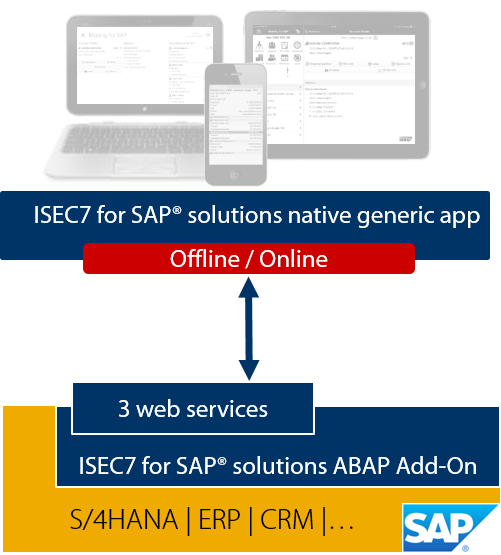 The ISEC7 Mobility for SAP framework provides a simple way to develop the content in ABAP and customizing. Pages, their input fields and validations are defined in customizing. The content of the pages comes from ABAP coding, where methods allow the developer to put the content into the pages. In a 3 day workshop an ABAP developer is enabled to understand the framework, to enhance the out of the box solutions and to mobilize own processes. All screens of our out of the box solutions can be adapted based on a thought-out enhancement concept to meet your requirements. 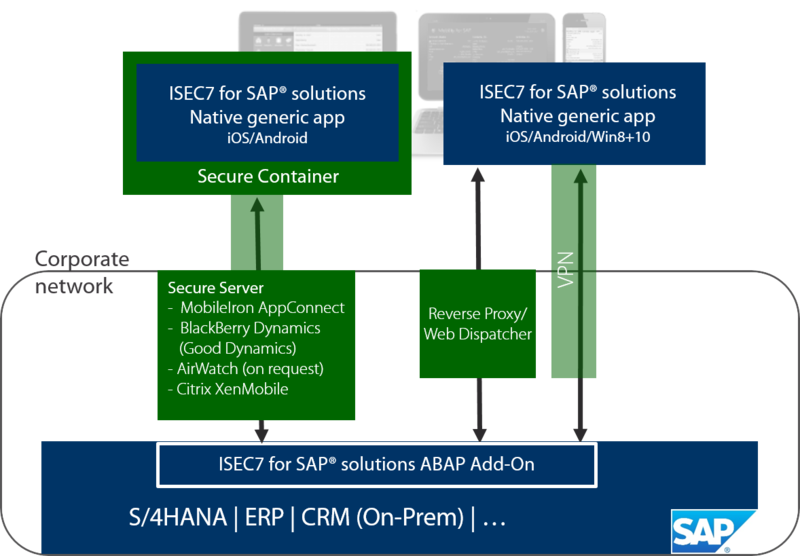 The native generic app for iOS, Android and Windows 8/10 is developed by ISEC7. Native means: It is a real app for the specific operation System: No Browser. No HTML. Generic means: All of our customers are using the same app. The app only renders what is defined in ABAP in the backend. All development for the customer is done in pure ABAP. Look & feel of each mobile device is considered automatically by the native application. You have the same information and functionality on all devices without additional effort.